This week’s TelVue Connect 2.0 upgrade marks a significant milestone in the evolution of TelVue’s cloud video platform: TelVue Connect’s powerful Content Management System (CMS) has been integrated with a radically new version of TelVue CloudCast’s Live and VOD streaming, giving our customers access to an all-in-one video workflow that can manage both broadcast and streaming/OTT channels from a single unified platform. All of the streaming management features previously in the CloudCast CMS have been ported into TelVue Connect, including an improved User Interface, User Experience, and numerous new features. TelVue Connect makes it a snap to manage your Live, Linear, and On-Demand streaming & OTT video channels with enhanced metadata, organization including Series, Playlists, Hierarchical Categories, Video Chapters/Indexing, and Related Links and Attachments. Uploading videos is as simple as drag and drop, with automatic transcoding to High-Definition, Adaptive Bit Rate streaming formats with Closed Captioning and audio normalization support. The TelVue Connect streaming & OTT management features integrate seamlessly with a brand new suite of TelVue CloudCast Videos Players – for Web, Mobile, and OTT. 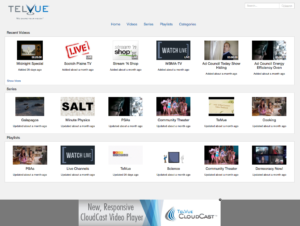 The new CloudCast Video Player for Web & Mobile has been completely revamped in the process. First of all it is responsive, which means the elements on the page will rearrange themselves to fit the size of the viewer’s screen. That makes CloudCast equally easy to navigate on a mobile phone as a tablet or PC. Adaptive Bit Rate viewing for an optimal HD and screen-size experience is supported across all major platforms and operating systems. The player also allows casting videos to Google Chromecast and Apple AirPlay devices. In fact the CloudCast player is much more than just a viewing pane. It is really a complete video portal that displays all recently uploaded videos as well as Series and Playlists, along with a Search bar, tabs from which you can drill down into Videos, Series, Playlists, Categories and optional Banner Ads at the bottom. The entire player, or any of its individual series, playlists, videos, chapters can be shared via URL, social media, or embedded in any website. Better yet, you can also launch your channels on OTT platforms using the CloudCast TV Apps to effortlessly create HD channels on Roku and Apple TV, either with the same content and branding as your CloudCast Video Player channel, or an entirely unique set of content. TelVue customers who are already using TelVue Connect in their broadcast workflow can now add the CloudCast Option to distribute the same videos to their Internet Streaming & OTT channels, bringing the concept of TV Everywhere within reach of even the most modest hyperlocal operation. The features of the new Connect with CloudCast are too numerous to list here, but for a complete rundown please consult the TelVue Connect release notes, here. A few days prior to this latest release, TelVue President and CEO Jesse Lerman gave an informal webinar tour of the new CloudCast features. Watch that recording, here.